I started with a stamp set from The Crafts Meow called Stitched Flowers. 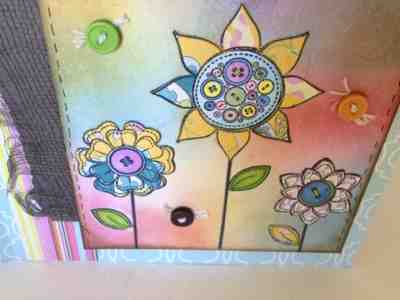 I paper pieced it and used my Copics to color the buttons inside the flower centers. 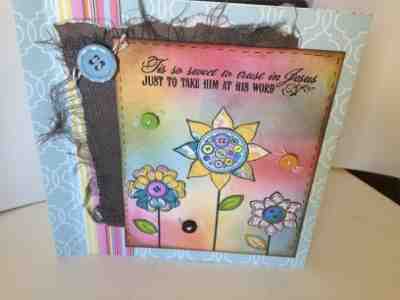 I also used my Distress Pads to add colors onto the background after I masked the flowers. 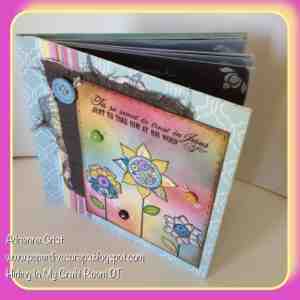 The top Sentiment is a Scripture from another TCM stamp set. To make it a little prayer book I took a sheet of design paper that was rather thick, cut the 12x12 sheet in half and scored it down the center and then one quarter inch on either side. I cut the new DCWV Chalkboard papers in the pale blue chalkboard and dark brown chalkboard down to about 5.75 by 5.75 alternated them and slipped them into the middle of all that scoring, oh I also scored them all down one side about 1/4", it was that side I slipped into the fold side. I stapled them with the Tim Holtz Tiny Attatcher into the little book, then used my 1.5" score tape to adhere my artwork to the front. VoilA! A little book! After the fact I felt the pages looked too bare so I edged them with a white chalk ink pad and then stamped the corners with a little decorative stamp that was a part of the scripture set. Now I have a sweet little book to jot my prayer requests down and then watch The Lord work as I trust Him with what concerns me. Such a cheerful and colourful journal cover.